Six months ago, Pitra wrote on his experience as a photographer of JKT48 performances. As fan photographers become more common in Indonesia, that has not always been the case in Japan, where photography of idol performances are often prohibited these days. However, as reported in Asahi Shimbun Digital last week, that practice is slowly changing. “Camera Boys” who follow idols’ activities (to take pictures of them) first rose as a phenomenon in the 1980s. It has been a long time since they vanished, but because of the idol boom in recent years, they are appearing again under a somewhat different guise. How is, then, the current habitat of such “Camera Boys”? 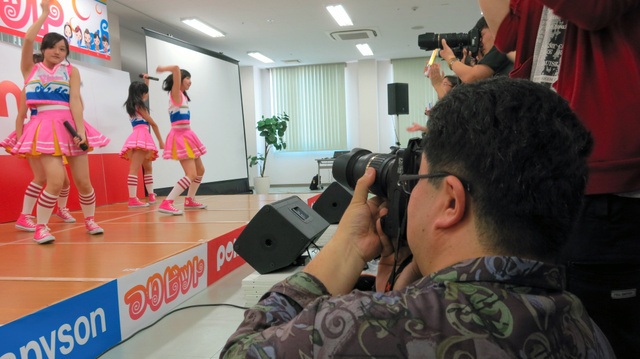 Hakata’s “Take-san”, photographing the idol group Tsuri Bit in Kitakyushu. Take-san is a known figure among idol fans. His picture of Kanna Hashimoto (16 years old), member of the Fukuoka local idol group Rev. from DVL, was a huge topic on SNS and propelled the young idol to national stardom. Fans call that picture a “Miracle Shot”. It was 2009 when Take-san truly started his career as idol photographer. Thinking that he wanted them to gain popularity, he started posting photos of the idols he was cheering for, such as Manaminorisa and others. Eventually he became interested in Rev. from DVL and started going to their live performances. It seems that Kanna Hashimoto would make funny faces on purpose every time Take-san pointed his camera at her. He continued all the same, aiming to capture dynamic shots. “Camera Boys”, idol photographers, first rose to fame in the 1980s because of cases of the sale of risqué photos taken at idol live shows to magazines. Talent agencies began to enforce their publicity rights toward editors, and as taking photos turned taboo in live performances so the “Camera Boys” vanished from sight. Famous idol groups still mainly keep the no-photography rule except in particular events, and taking photos of Kanna Hashimoto too has become harder after her rise to fame, but in the case of idols still on the way to the top, (taking photographs) is instead welcomed. Aries Entertainment (Usa☆Usa Shojo Club, etc.) CEO Kazuaki Watanabe allows the usage of cameras in the live shows sponsored by his company. In the beginning, there were also incidents of attrition between camera boys and fans simply there to cheer, but they disappeared over time, and fans using their cellphones’ camera function increased too. The members themselves started paying more attention to cameras and their own expressions. The idol Arisa Machida at a photography session at the Fresh! Studio in Akihabara, Tokyo. In Akihabara, Tokyo, “photo sessions” with idols are popular too. In the weekends, the venues of such events are packed with amateur photographers. Many of them, after obtaining proper permission, post the photos on their blogs. The idol Arisa Machida (19 years old) pulls up her hair, gets on her knees, and answers all the cameramen’s requests. Some fans become frequent customers too. It’s her third year of participating to such events; “it makes me happy when they tell me that I’ve started to look like an adult.” Will a “miracle” appear here too? Original article by Motohiro Oonishi for Asahi Shimbun Digital. Italian guy living in Japan. I like all 48 groups but JKT interest me the most. I wish to contribute to their popularity in Japan and see them do an event here! Team J = Veranda, Gentiga = Nina, but my oshi is Ayen :) I never wanted to support someone as much as I do her. Firstly, thanks to Wotaliano for the article and translation. I’ll be frank: one of the reasons why JKT48 attracted my attention was the number of fancams of their performances in the early days. It was nothing like I’ve seen. The carefully manicured image that the talent agencies ensure that their talent looks at their best in the official DVD/BD release in Japan: no such thing in the wild west of Indonesia. It is actually quite refreshing seeing the Idols without the filter and post processing of their talent agencies. They are still human. In saying that, the rise of the “Camera Boys” in Japan is more symptomatic of the fragmentation of the Idol sub-culture. Which is not necessarily a bad thing. The world is big for all of us. Hello wmlx, and thanks for your comment. As the article says, it’s more about “love” than about “money” this day and age. get very limited or fully disappear. It is the ultimate irony in Idol-ing (is that even a word? ): part of their appeal is their underground nature. Because their are underground, they need all the exposure they can get, including via Camera Boys. But as they become more successful, their appeal drops. And the image restrictions begin. As a Underground Idol (地下アイドル) fan you want them to do well, but when they do, it dilutes their attractiveness. It is almost as if the only way to keep the magic is for them to never improve. But if anything does not improve it slides into obsolescence. “Love” doesn’t pay the bills, but the way the アイドル industry monetises their acts makes the magic of their products disappear. For what it is worth I find myself wistfully looking back at JKT48 in 2012-2013 sometimes, when they were unpolished and more raw. There is a certain amount of nostalgia for me rewatching some of the early fancams. I suppose that is how people end up in the 2D アイドル space. Sorry, please let me do small corrections. I have made the corrections. Thank you, manak.